MOWER LOANER AVAILABLE while you wait for yours to be repaired. We have great clearance pricing on all the tools you need! Visit us today! Come in to check out our store. New Tools are available weekly! INCLUDED: Change engine oil, clean/replace air filter elements, replace spark plug, sharpen mower blades, condition fuel system (may replace gaskets, fuel lines, carb kit, primer bulb), check/replace worn belts, check engine operating system, check/lubricate cables, check all safety components for proper operation, test run and adjust as necessary. Any items needed that are not included such as recoil repair, carburetors, wheels, blades, cables will be provided as an estimate. INCLUDED: Checks the output voltage and makes adjustments, services the engine, change engine oil, clean/replace air filter elements, replace spark plug, condition fuel system (may replace gaskets, fuel lines, carb kit, primer bulb), check engine operating system, checks the brushes, tests the battery charging system, checks ignition, check all safety components for proper operation, test run and adjust as necessary. Any items needed that are not included such as recoil repair, and carburetors will be provided as an estimate. We service many different power tools, and all have their own individual standards. All power tools are tested when they come in. We attempt to duplicate the complaint or malfunction. Each power tool is cleaned and inspected for wear or breakage. Required repairs are evaluated and quoted to the customer. Once the estimate has been approved, we reassemble with quoted parts and tested according to manufactures recommendations. We have been providing quality tool repair and equipment maintenance in Eugene Oregon since 2003. We pride ourselves on offering honest and reliable service. We take time to develop long term relationships with our local community, its members and businesses. When we are not at the shop you will find us on the soccer field and digging in our community garden plot. We work hard to maintain a updated reliable calendar of closures so you can be in the loop and we can spend time with family and friends. New Hand Tools, Specialty Automotive, Heavy Duty Truck Tools, hydraulic jacks, pullers, oil filter wrenches, impact wrenches, impact sockets, grease guns, hammers, air tools. Honda engines, Multiquip/Mikasa, Briggs & Stratton, Kohler, Generac,Wacker Neuson, Robin Subaru, MK Diamond, Tanaka, Hitachi, Flex, Powermatic, Jet, Hein-Werner, BVA, Porto-Power, Iron Horse, Eagle, Max Air, Sawstop, SK tools, Proto tools, Gearwrench, Sunex, Vim, Wilton and more. We take pride in our projects and work smart and make repairs that last. We test all our repairs so you can get back to work. We have dedicated ourselves to our trade and community to provide the best service at reasonable rates since 2003. Best prices around and family owned and operated. Been coming to them for a couple years. Been having Eugene Power fix all kinds of tools new, old, big and small. Have been great to work worth, Thanks guys. Bill and the gang do a great job for our needs. Everything is taken care of in a timely way. They are always willing to take on extra work loads as well as getting things fixed and working quickly. I know they work hard and extra hours to make sure their customers needs are filled. We have even brought stuff in and needed it in the next day or two and they got it done. And they deliver!!! Awesome place to bring things! …About a week after I dropped off my mower (they originally told me it would take about two weeks) I got a call telling me what was wrong with the mower (there were multiple problems) and that it should be ready for me to pick up the next day. It cost less than $60 for the repairs and time. The woman who owns the shop even remembered my name when I came back in. Their two little kids were there helping mom and dad that day, and helped me load my mower into my trunk and process my payment. Great company with fantastic, genuine customer service. Eugene Power Tool has been a highly dependable provider for most any type tool repair and or replacement, when required, for over 10 years now. Service is just as important to us as the cost. Bill and Lisa perform at the top level day in and day out. I have several “emergency” type repairs every year that requires them to go above and beyond a normal service but they continue to perform with a smile and quick turn around for us. 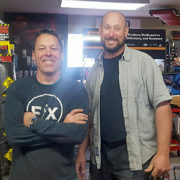 They are our “Go To” people for tool repair. Thank you Bill and Lisa!